Lisbon, capital of Portugal, has experienced all kinds of influences, from the four corners of the world. When the country was trading all around the world in the 16th century, the city built magnificent monuments. Under King Manuel I, Portugal reached its peak in controlling global trade. The money flowed abundantly at this time, Europeans buying the products that Portuguese brought from the other end of the world. 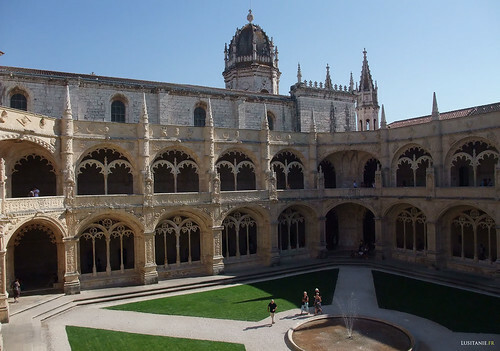 One of the greatest achievements of this era is still visible today, the monastery of the Hieronymites, or in Portuguese, the “Mosteiro dos Jerónimos“. For those who like to remember the great era of discoveries, where a handful of sailors engaged on frail boats of wood looking for fortune in India, in America or China, the ideal place in Lisbon is no doubt Belém. 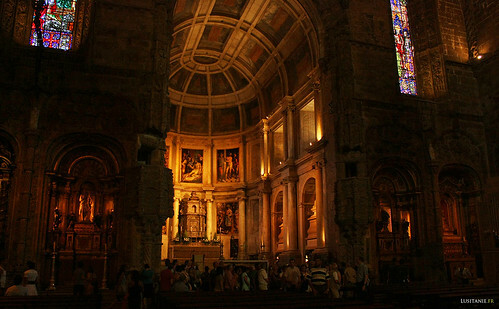 Located in the extreme west of Lisbon, the district has plenty of major monuments. 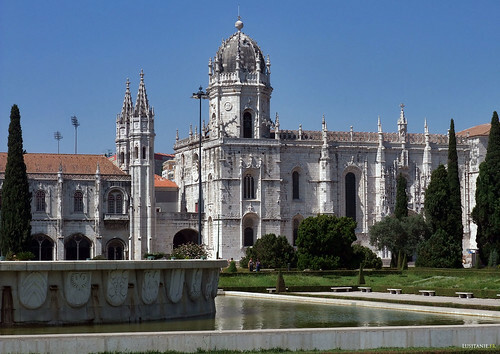 By chance, its peripheral position from the centre of Lisbon allowed it to escape almost unscathed from the massive earthquake of 1755. 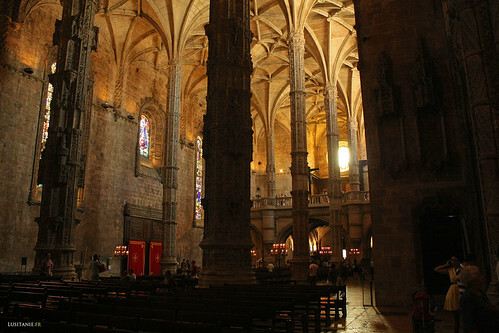 It is here where we can have a vague idea of what could have been the time of splendor of Lisbon, when the King was not looking at expenses to do great buildings. 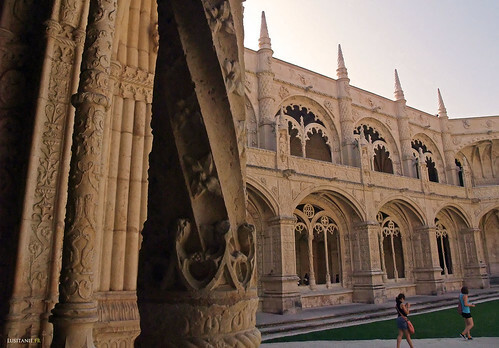 The monastery, central monument of Belém, is the symbol of the richness of Portugal in the 16th century: to build such a monument, money from taxes on pepper was sufficient alone to finance! 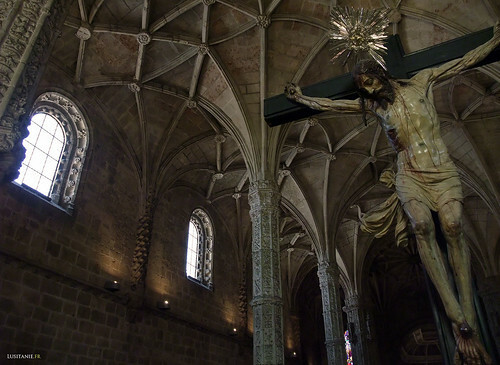 You understanded it, the Jerónimos Monastery is of mandatory visit. To get there, nothing better than taking the tram. Tram is a rapid and effective way of getting there from the center of the city. Situated on the Tagus river, some modern infrastructures are spoiling its location: no doubt the price to pay for a railway line, which cuts the monastery from the edge of the River, where you can find another great monument dating from the discoveries, the Tower of Belém… In any case, the space is not missing, and the fabulous “Praça do Império“, with its fountain of colossal proportions, enhances the prospect that one can have of the monastery. Descending of the tram, we are struck by the whiteness of walls, contrasting, in summer, with the blue of the sky. 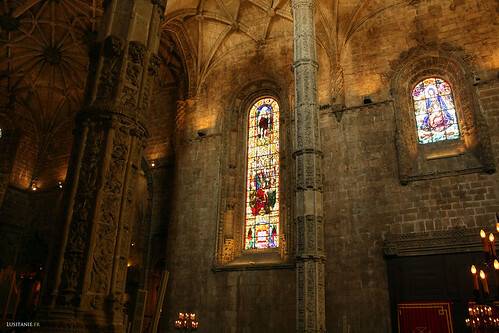 Lisbon is a city vowed to light, with these rays of Sun so characteristic of the European South. Here, the sensation of space, involved in this special brightness, sing us the magnificent, reminding us of a time in the past, where the ships were unloading their wealth in Lisbon. Everything began with the discovery by Vasco da Gama of the sea route to India, finally abolishing the heavy taxes imposed by the Arabs to European trade. Indeed to go to India, Europeans needed to cross areas which at the time were controlled by Muslims. To celebrate this happy event, King Dom Manuel I asked Pope’s permission to build a large monastery. 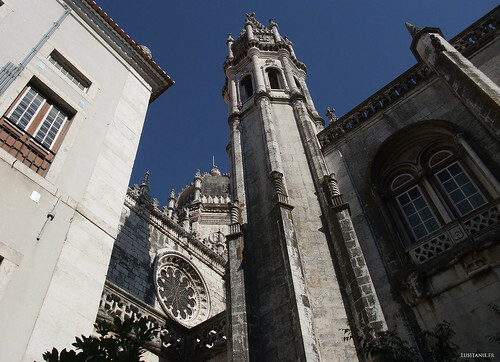 Construction began in 1502, with the monastery dedicated to Saint Mary of Bethlehem, or, in Portuguese, Santa Maria de Belém. The monastery, would now host the monks of the order of the Hieronymites, i.e. the order of St. Jerome. The ideal place to build the new building was the former beach of Restelo, a location at the mouth of the Tagus, a place that all vessels departing or arriving from Lisbon can see. 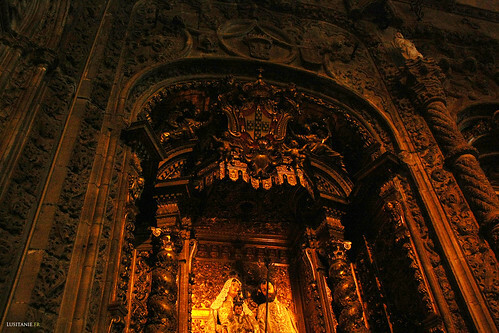 It already existed on the location a chapel, “Capela do Restelo“, built by the prince Henry the Navigator. 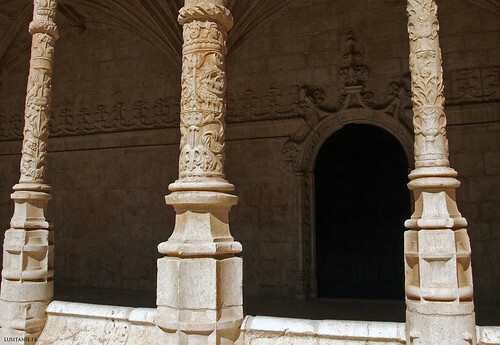 In this strategic location, the monks of the order of Christ could provide assistance to pilgrims passing by. 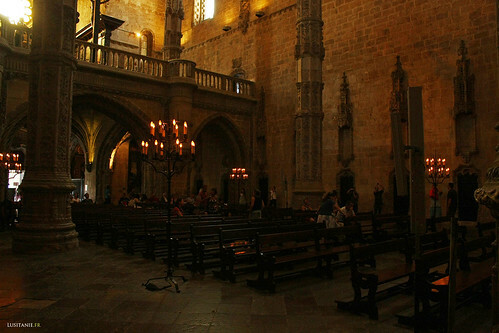 Vasco da Gama and his men had prayed in this place just before leaving on their expedition to India. The chosen architect is none other than Diogo Boitaca, one of the main artisans of the style known today of “Manueline”, by the name of the King. 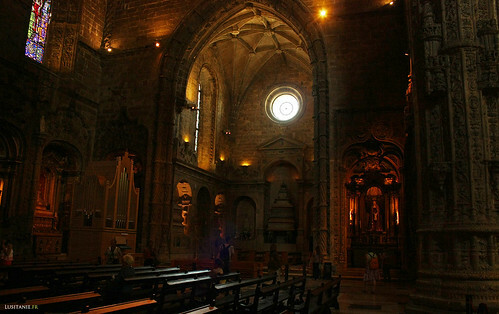 Before coming to the monastery, he had already proven in the monastery of Jesus in Setúbal its qualities. His good work certainly enabled him to obtain the favour of the King. He was then appointed to the most prestigious construction of his time. 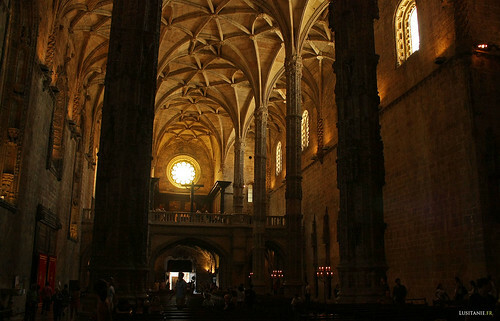 Boitaca (or Boytac) worked on the monastery of Lisbon until 1516, date at which he began working for Batalha. To succeed, it is his assistant João de Castilho, who was naturally selected. It would take a century for the monastery to be completed. 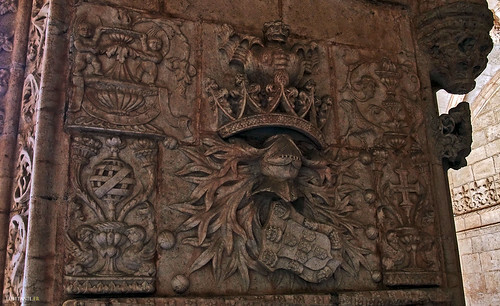 After João de Castilho, architects Diogo de Torralva and Jerónimo de Ruão (or Jérôme de Rouen) continued the work. The choice of the location for the construction of the monastery, on a sandy beach is one of the explanations for the lack of damage caused by the earthquake of 1755. Anyway, the dormitories were affected, and rebuilt, with a profound realignment in the 19th century. 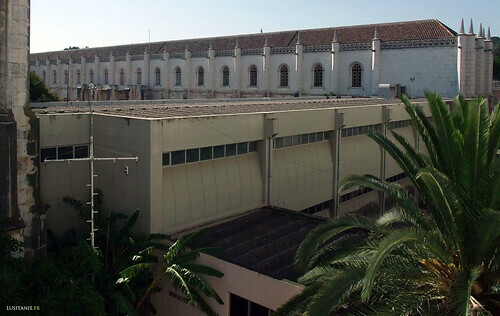 Here is located the Museum of the Navy and the National Museum of archaeology, where people can discover the recovered treasures of different archeological finds in Portuguese territory, ranging from the Bronze Age to the Visigothic period. The damages of the earthquake were relatively benign in comparison to those caused by the Napoleonic troops in the early 19th century. 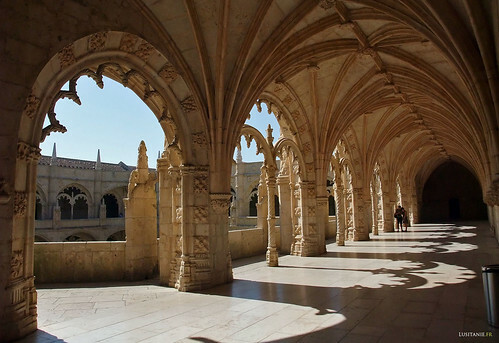 In 1833, with the end of the monastic orders in Portugal, clerics, who occupied the place for 400 years, had to leave the scene and the monastery became State property. They were replaced by the Casa Pia until the 1940s, an institution of charity for children. 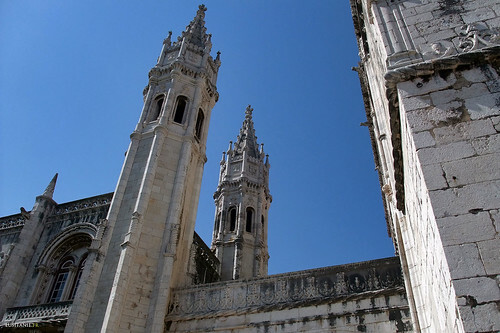 The importance of the entire building, and the nearby Tower of Belém did not escaped to UNESCO, which in 1983 makes it a “world heritage of humanity”. 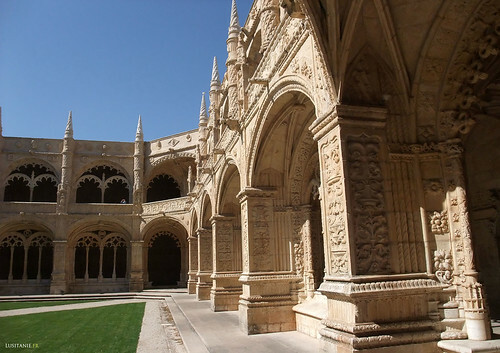 The dominant architecture of the monastery is late Gothic, in its Manueline form, typically the beginning of the 16th century Portuguese architecture, corresponding to the reign of King D. Manuel I: from 1495 to 1521. 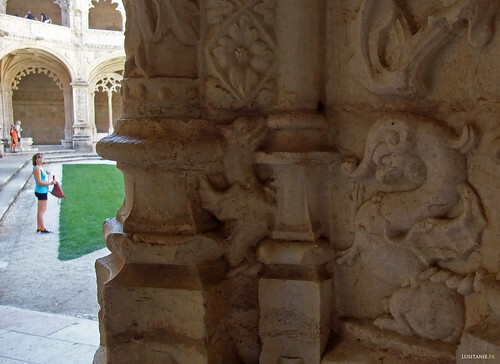 Manueline architecture is characterized by abundant decorations from discoveries, sea and symbols of Portugal. 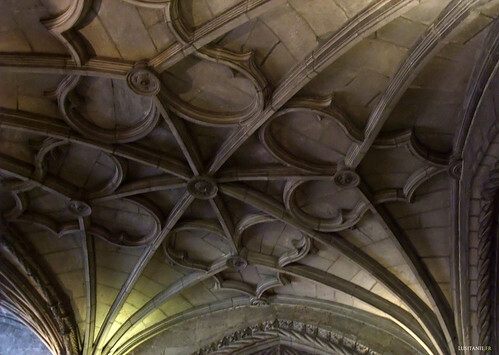 Thus, it is not uncommon to see shells and fine details like stone ropes, giving his last chips to an ending Gothic. When one arrives at the monastery, it is impossible to miss the impressive “Porta Sul”, the South Portal, and the proliferation of details in the white walls of the Church of monastery. This door, a work of João de Castilho, is monumental, but it’s not the size that matters, but the sculptures. There we can see the Infant Henry, or “Henry the Navigator”, main instigator of the Portuguese maritime discoveries. The western portal, where the public enters the Church is another of the treasures of the monastery. Details abound, the sculptures are fine and detailed. 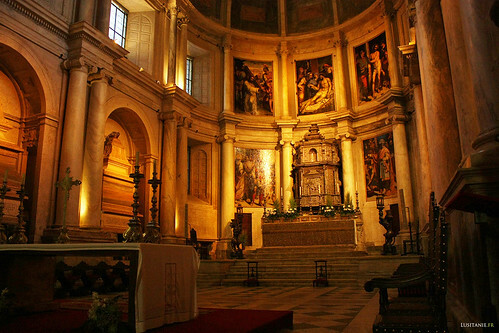 We can see there the King Dom Manuel I and Dona Maria kneeling in oration, as well as Saint Vincent, patron of Lisbon and the Apostles. 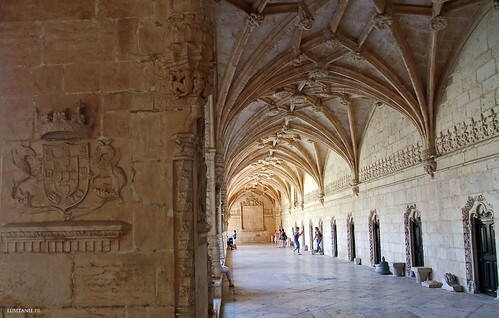 Once past the monumental door, we are in the Church, Church of Santa Maria de Belém. 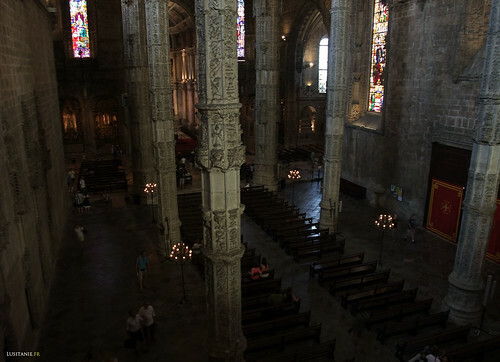 In this church, we can find the tombs of great figures of the maritime history of Portugal, who marked forever the European and world history. Vasco da Gama is regarded by the Portuguese, probably rightly, as being the biggest sailor that is! 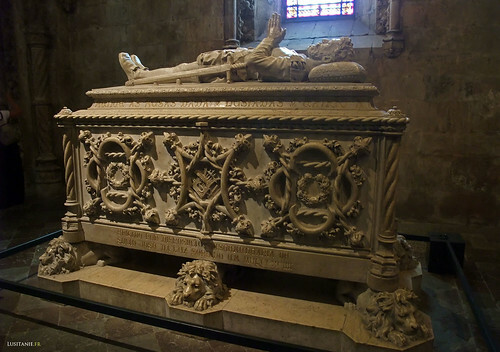 It is here that we can see is monumental Tomb, only equaled by the tomb of great writer of the “Lusiadas”, Luis Vaz de Camões, on the other side of the Church. 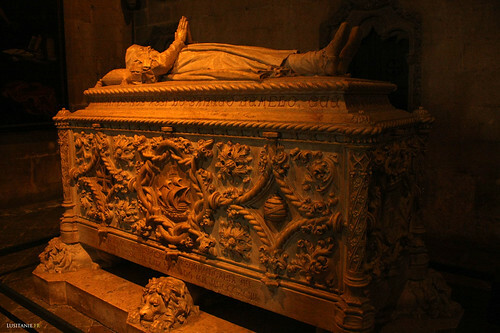 These tombs are late, carved in the 19th century by Costa Mota. 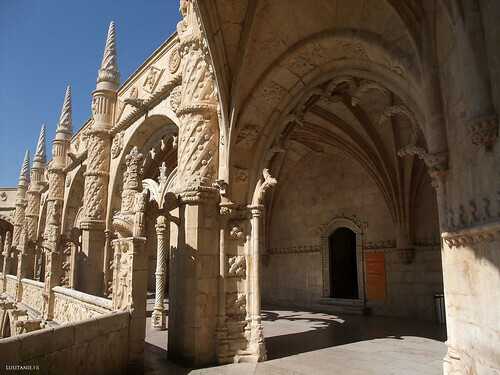 The beautiful original sculptures of the monastery are, for many, a work of French sculptor Nicolas Chantereine, who lived most of his professional career in Portugal. 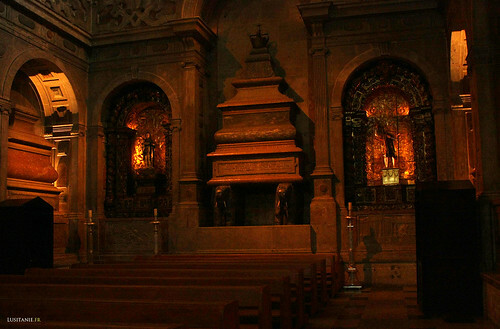 The “Capela-mor“, or main Chapel, is later, end of the 16th century. 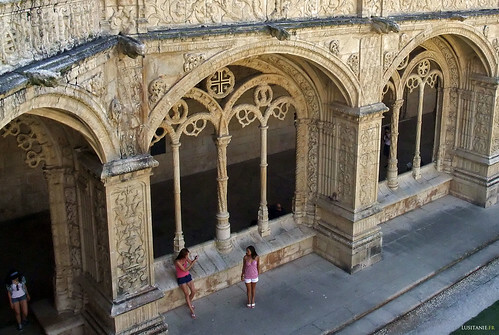 Designed by Diogo de Torralva and built by Jerónimo Ruão, is not really Manueline Art, but rather Mannerism Art. Everything here is made with polychrome marbles. The paintings, depicting scenes of the Passion, were painted by Lourenço de Salzedo at the same time. The tabernacle was designed between 1674 and 1678. 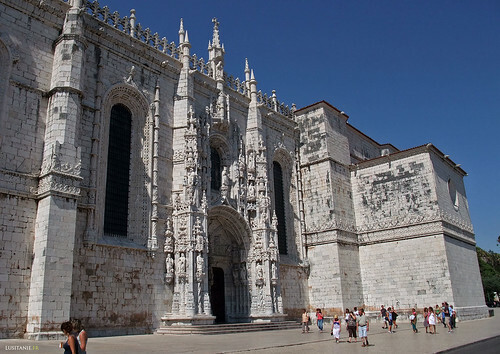 It was offered by the King Dom Afonso VI in thanks to God for his victory of Montes Claros in 1665, finally acquiring the independence of Portugal from Spain. 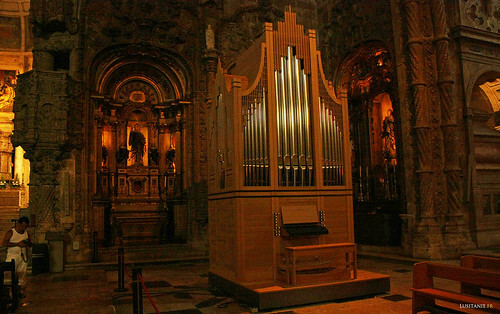 The top choir, or “coro-alto”, is a second choir of the church. As its name indicates, it is located in height, overlooking the nave. We can admire paintings representing the Apostles. From the original dozen paintings, two are missing, lost in the earthquake of 1755. Their author is not known. 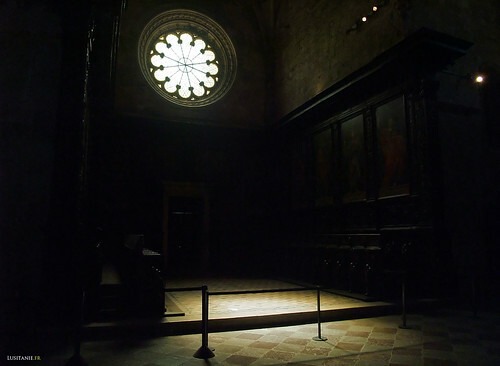 It is here that the monks were to sing and pray, waiting the finalization in the 19th century of the construction of the chapter room. 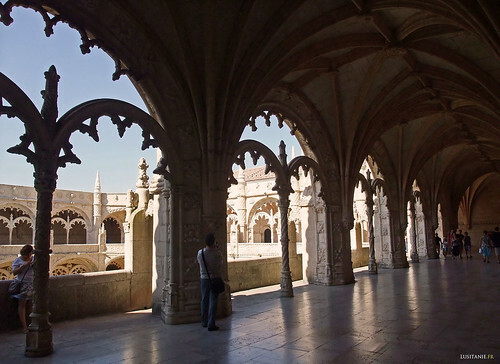 The cloister is the masterpiece of the monastery, completed in 1544. On the contrary of the Church, its entry is not free. There is no small profit, and this money is of course necessary for the work of restoration and maintenance of such monuments. But what happiness to be found in such a calm place, dedicated to reflection, even when it is filled with tourists! 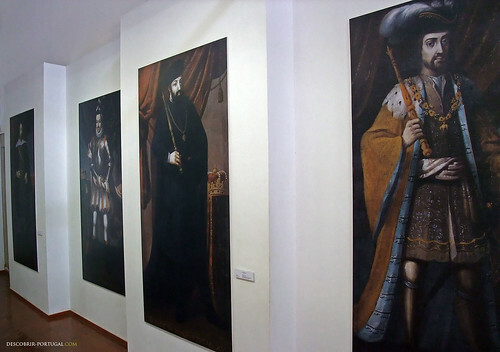 The first level is the work of Boitaca, while the upper level is a work of João de Castilho. Everything is harmonious, and would be concluded by Diogo de Torralva in 1541. João de Castilho was Spanish, and the Plateresque influences is naturally found in his works. It is in the cloister that we can find the tomb of the poet Fernando Pessoa, dating from 1985. 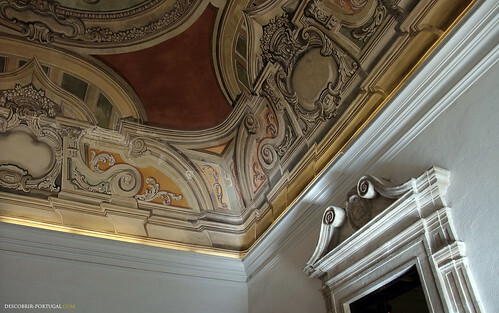 The importance of the building and its many sections (sacristy, chapter of room, library with its large permanent expo on the history of Portugal…) will be future articles on “Portugal Discovery”. A single article is not enough! 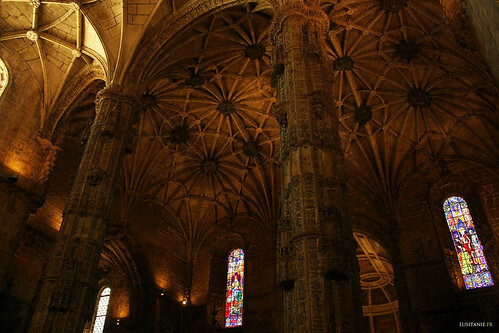 It is a place that you should not miss if coming to Lisbon! 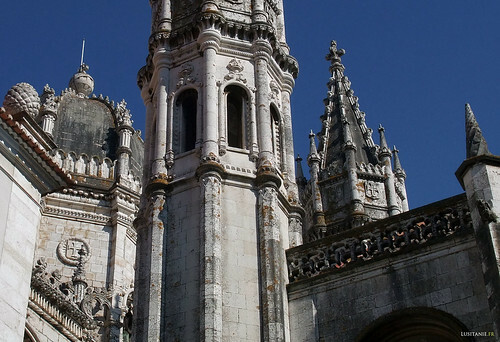 Just think that the main Portuguese pastry, Pastel de Nata, was created by monks of this monastery to understand the importance of this building for the Portuguese, in addition to the national symbol it represents. July 29, 2011, 4:48 pm, "monument". Portugal Discovery, July 29, 2011. Portuguese version : Descobrir Portugal. French version : Lusitanie.fr.